Perhaps the easiest way to grant workers a bonus is to set one up while creating your study. Near the bottom of Tab 4 Setup HIT and Payment, you will see an Automatic Worker Bonus box. To automatically bonus workers as they are approved, simply enter a value into this box. Once workers are approved, they will be given a bonus in the amount you specify. Although this option is easy, keep in mind that using this method means all workers are given a bonus for the same amount as soon as they are approved. Since approvals cannot be reversed once they are issued, you will want to check your data before issuing approvals. If you need more flexibility in how you grant bonuses, you can use option number 2: awarding bonuses in batches. A second way to award bonuses is in batches, after workers have completed the study. By clicking on the green Grant Bonuses button in the Actions column of the study Dashboard, you will be taken to the grant bonuses page. From this page, you can award bonuses by specifying Worker IDs and the amount you want to grant to each participant. If you want to grant different workers different amounts, you can break workers into groups, or batches, and grant bonuses batch-by-batch. On this page you can also include a message to workers if you want. Sometimes, researchers want to grant multiple bonuses to workers within the same HIT. For example, a researcher might grant all workers a bonus for progressing to the end of a study, but then also grant additional bonuses based on performance. When you grant multiple bonuses after a study is complete, it is important to know that worker bonuses within any one HIT are cumulative. This means if you gave a worker a bonus of $1 as soon as they completed the study and would like to grant them a $1 bonus based on performance you must enter $2 into the amount text box. To help you quickly identify how much you have bonused a worker within any one HIT, we created a search box you can use to find the total bonuses awarded to each worker. Simply paste a Worker ID into the box and click search. While awarding bonuses in batches is a good way to grant different amounts to different workers, the most efficient way to grant workers individualized bonus amounts is using a table or a .csv file upload. On the grant bonuses page, you can choose to grant worker bonuses in different amounts by clicking on the new feature option at the top. Once you click on this option, you will be taken to a new page for granting bonuses. Here, you can grant bonuses one-at-a-time by clicking Add Worker and entering the Worker ID and amount you wish to bonus each person. Alternatively, you can create a .csv file that has the MTurk IDs of all workers to be bonused in the first column and the total bonus payment they should receive in the second column. Using this method, each worker can receive a different amount if needed. After you upload the .csv file, click Grant Bonus and all bonuses will be given. When granting bonuses, there are a few things to be aware of. 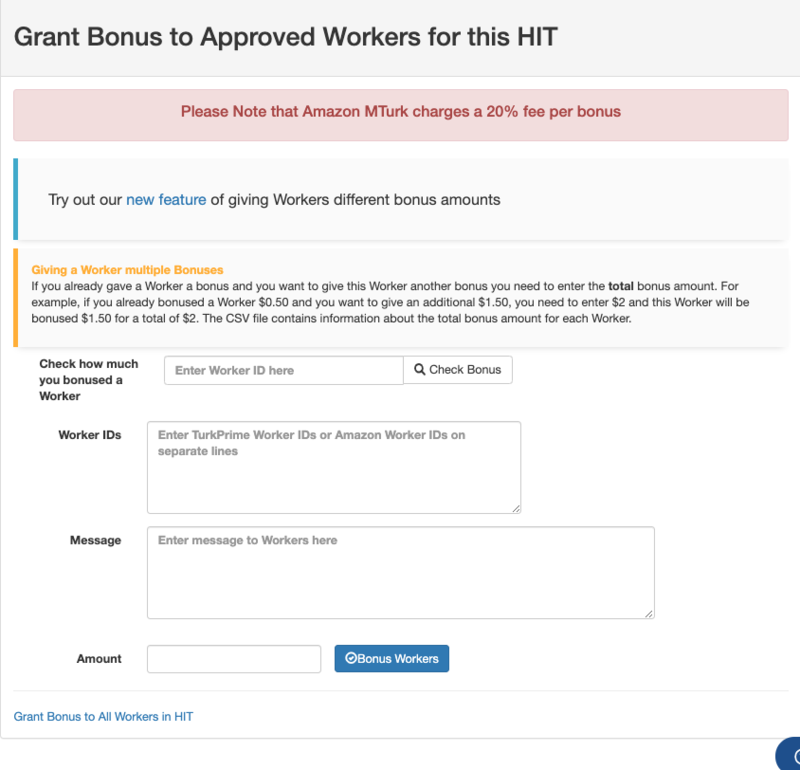 First, MTurk charges a 20% fee on all bonuses granted to workers. Second, the amount you bonus workers is cumulative within any one HIT. This means if you are granting bonuses to workers for multiple reasons in the same study, you will have to add the amount you wish to bonus the worker to whatever accumulation of bonuses you may have given that worker already. Put simply, for a worker you wish to give a $1 bonus to and who has received $1 from you already, you will need to enter the bonus amount as $2.